Summer is a time when people work hard and play hard. Then they perspire – a lot. Air conditioning has made the inside of our homes more comfortable, but it just doesn’t work out in open-air or highly ventilated areas. A breeze blowing over your moist skin refreshes and helps lower your body temperature, but Mother Nature doesn’t always provide one, especially if you are working in an area that isn’t completely open-air or on a day when the air is still and overly warm. This is where a wall-mounted fan can be an excellent appliance to have around. A wall-mounted fan, like a ceiling fan, doesn’t take up valuable floor space. Many wall-mounted fans are wired in, eliminating trailing cords that can create hazards. Even if the wall-mounted fan needs an electrical outlet, it is less difficult to train the cord so that it is not vulnerable to water or in a position to cause someone to trip. Not all fans that can be attached to walls are the same. Some have elegant or beautiful fixtures, making them an excellent choice for your veranda or patio. Others are more utilitarian, appropriate for your garage, greenhouse or barn. Some are rated to be run in areas where damp is a problem – such as in a greenhouse, while others need to be protected. Fans of all sorts include those that blow in one direction, while others are oscillating fans that move to spread their breeze around. Wall fans are no exception. The amount of air they can move and its velocity also vary. Although it is sometimes considered impolite to say so, humans perspire to regulate their core temperature. The thermometer climbs, and your pores begin to exude a dew of moisture to help you feel more comfortable. A fan, unlike an air conditioner or even a swamp cooler, does not cool the air that flows through it. Instead, it blows across your moisture cooled flesh helping your perspiration to make you feel cooler. Here is a collection of wall-mounted fans, some decorative, some utilitarian, to make your summer work and play more comfortable. Not all areas around your home lend themselves to air conditioning. These include screened porches, open-air garages, and similar locations. Even in rooms where air conditioning is possible, moving the air can make it feel cooler. A wall-mounted, three-bladed fan combines the elevation of a ceiling fan ease of application. The Hadlee Three Bladed fan could be the answer for those hard-to-cool spaces. Love your patio, but hate those breezeless days? The Melody bronze 13” outdoor wall fan could be the perfect solution to making your own breeze. Approved for damp areas, this fan, supported by a graceful goose-neck mount, can make the difference between enjoyment or misery at your poolside lounge or on your patio. It can even function in a greenhouse. Bring your own breeze with old-world elegance and style. The old Havana outdoor fan is a wall-mounted fan approved for use on patios and under awnings. The rust-colored elegant mount is uni-directional, meaning that the breeze is focused on one area – such as your favorite lawn chair. It has three speeds for your added comfort. 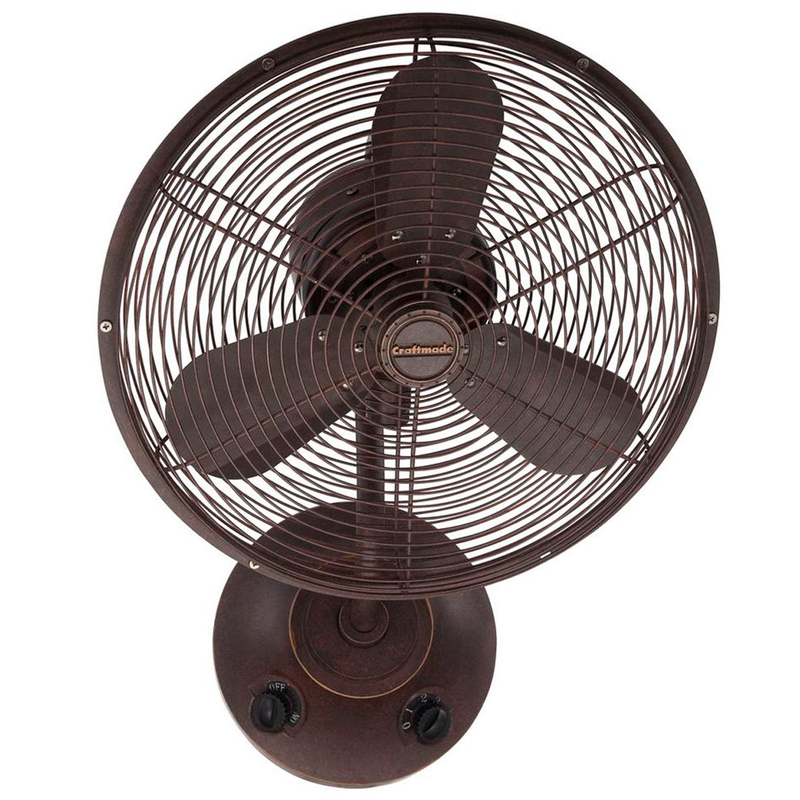 Wall mounted oiled bronze 13-inch fan can increase the comfort of your southern style veranda. In the Old South of the United States, homes with wide porches were favored because they allowed the family to sit outside in relative comfort. Air conditioning has changed some of that, but with a forced-air breeze, you can still sip cooling drinks and watch the fireflies dance on the lawn. Need that veranda or patio cooled for a party or event? A chrome colored four-blade oscillating fan might be the answer for shared comfort. A convenient wall switch makes it easy to switch the fans on when needed, yet conserve electricity when not. The chrome color can blend well with light-colored fixtures for a less heavy decorating effect. Perfect for those corners in your home where the air seems to stop and heat up unbearably. Easy to mount, this oscillating fan can be controlled by the center knob or by the pull chords. It does need a plug in – it’s not hard-wired, which can be its own convenience. The fixture is black in color and has a three-blade fan. Wall mounted on a beautiful, brushed nickel mount, this thirteen-inch oscillating fan can provide ventilation is a location where a little air movement is appreciated. This could be near the outside grill, your favorite patio chair or the veranda porch swing. It goes well with white wicker or similar light-colored furnishings. This wall mounted fan from Savoy comes with a six-foot cord. It can be plugged into an outlet, or it can be wired into the house. It is rated for outside use, and is resistant to damp conditions, but should still be under cover such as an awning or veranda. It can be used with a remote control, but the remote control is not included. The Hurricane Super 8 is an amazingly all-purpose wall mounted fan. Its figure eight air flow lends itself to better circulation. It can be programmed to three different speeds and three oscillation patterns. It can be used in your home, greenhouse, garage, on the veranda, patio or just about anywhere that you need the air to move and ventilation to be improved. While no fan is completely quiet, it produces less noise than other in-line fans. When it comes to outdoor fans, this one does it all. The Master Mac 30-Watt high-velocity wall fan is suitable for use in garages, barns and in other too-warm location where summer brings high-levels of work. It has a high airflow – 8500 CFM – and comes with a one-year warranty. Summer brings outdoor work and fun, but that doesn’t mean you can’t have a cooling breeze while you are doing it.